Doors open from 7:00 PM. Arrive early to avoid queues. Place your snacks on the food tables or in the commercial fridge, then relax and enjoy the beautiful ambient music. Immerse yourself in a spiritual new year of ecstatic chanting, natural meditation, and healing music set against a backdrop of beautiful lighting, in a charming air- conditioned venue. Everyone feels like a friend in this vibrant and meditative social space. You can sit on freestanding chairs, move to the music, or relax on a floor cushion. No drugs or alcohol at this event but you can share BYO vegetarian snacks, and help yourself to nourishing chai during the intermissions. The energy will rise gradually throughout the evening with Jarek's universal chants, culminating at midnight in a choral cascade of flowing om chants. Start your new year on a foundation of peace, love and well being. You walk under a Pepper tree and past lavender bushes to enter the air-conditioned venue. Its full of charm and good vibes. 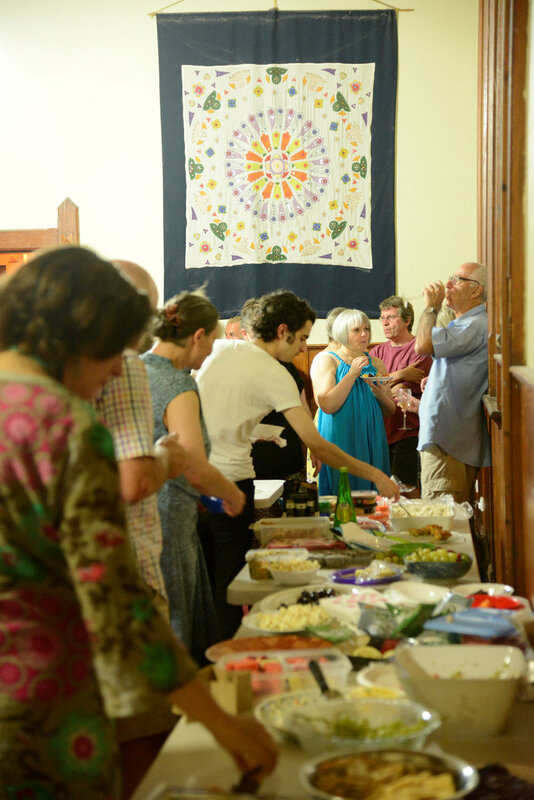 People have brought vegetarian snacks to share and are placing them in the supper room, while others are presenting their tickets at the door. In the main hall there are large cushions scattered about, skirted by freestanding chairs. You find a comfortable seat, you're feeling relaxed, and among friends. Everyone settles into silence, and natural meditation. Soon Jarek takes the stage, and the main event begins. With a foundation of acoustic guitar, bass, percussion and mixed voices, the music sounds contemporary, melodic, and imbued with influences from the 60s, along with the call and response style of kirtan. Jarek's guitar and chanting is accompanied by some of Australia's finest instrumentalists. Jarek's music has a universal flavour supporting a blend of English and Sanskrit words with a focus on inner peace, love and spiritual awakening. Looking around the space you notice people moving or dancing, while others sit in meditation, and some recline on the floor. Almost everyone is singing. Instead of clapping after each chant everyone enters a deep silence for a few timeless minutes. Before you know it the gentle ebb and flow of the coloured lighting draws your attention back to your senses, and you notice the sweet aroma of chai announcing intermission. Periods of socialising punctuate the group singing. During the breaks people chat and share their snacks indoors or out in the garden. The evening ends with a meditation for peace, accompanied by waves of OM chanting, and you are one of the waves on this ocean of sound, lapping at the shores of bliss. It's the New Year and the time to go home is drawing near, but you just want to stay. The event is led by Jarek Czechowicz, pronounced Yarrek Che'hovich. Jarek is a guitarist, contemporary chant leader, and founder of New Year's Eve Chanting and Meditation, Jarek creates words and music for spiritual awakening. He performs chants and mantras that embrace you with a feeling of love, intuitive improvisations that soothe your soul, and presents guided meditations that fill you with a sense of inner peace and freedom. His work has been described as a spiritual teaching through music. Jarek has appeared in the national publications as diverse as Living Now magazine and BRW. Universal chanting is the singing of enlightening words and mantras that are set to music in a contemporary western style. Everyone repeats the chant together. Some universal chants chants will maintain a steady meditative tempo while others will gradually become faster and faster leading to an experience of ecstasy. Contemporary kirtan is a call and response style of chanting where the leader sings the chant and the chanters respond. Some contemporary kirtan chants will maintain a steady meditative tempo while others will gradually become faster and faster leading to an experience of ecstasy. Ecstatic chanting is any form of mantra chanting that has the potential to lead chanters into the experience of ecstasy and bliss. Active Meditation is state of total absorbtion in an enjoyable activity. When the chanter becomes totally absorbed in the chant, to the exclusion of distracting thoughts, then the chanter enters a state of active meditation. Natural Meditation is one's natural state of clarity that becomes more noticeable in the silence after a chant, or after some other form of active meditation. Sacred sound is any sound used consciously for the purpose of, or as an expression of, divinity, oneness or spiritual awakening. The sound OM or AUM is the most ancient sacred sound. 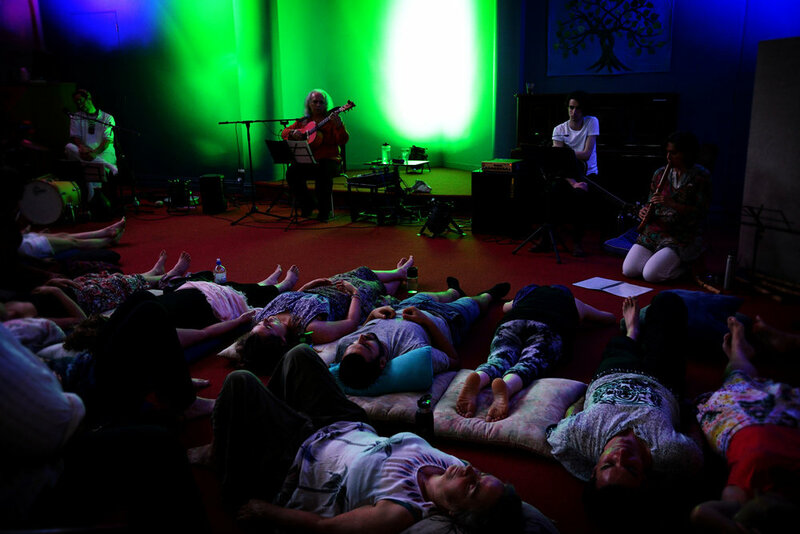 Spontaneously created melodies, harmonies, pitched and unpitched sounds that form entrancing waves of vibrations that soothe, comfort and bathe you in a healing experience and facilitate meditation. Everyone chants OM together, each at their own pace and pitch. This acknowledges the individuality of each participant while the group creates divine waves of blissful and healing sound. * This event is suitable for children who have a natural inclination to participate quietly. Drive: Melway Map 45 E11, allow time for parking in surrounding streets. You know what to do :) Here’s the Facebook event page.